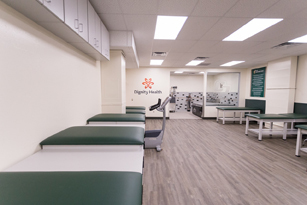 SAN LUIS OBISPO, Calif. — The $260,000 renovation of Cal Poly Athletics’ Sports Medicine and Athletic Training room inside the Mott Athletics Center is complete. 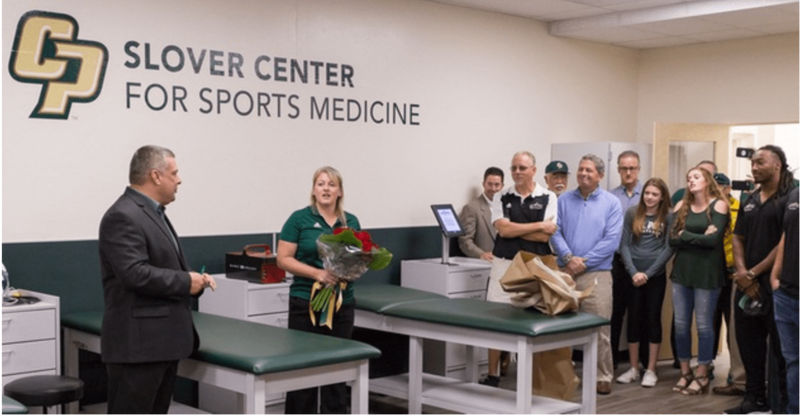 The 2,500-square-foot area underwent a complete transformation and, on Friday, officially became the Slover Center for Sports Medicine in honor of Kristal Slover, Cal Poly’s assistant athletic director/head athletic trainer for over 15 years. Last updated in the early 1990s, the space services all 550 student-athletes across 21 varsity sports. The project broke ground in mid-July and was completed Thursday. • new office configuration, allowing for privacy for health-related conversations. The renovation was supported by the Athletic Directors Council as well as parents of current and former Cal Poly student-athletes. Cathie Cardoza Conner, a member of the Athletic Directors Council and Brian Conner were major supporters of the 100 percent privately-funded project. “Today is a very ex citing and historical day for Cal Poly athletics as we unveil the newly modernized sports medicine area,” said Cardoza Conner. “This overdue and much-needed renovation is vital to the continued success of our athletic programs and will directly and positively affect all of our student-athletes. “As a former student-athlete, I truly understand the importance of needing an upgraded and fully functional training room facility, not only to serve our student athletes, but for our trainers to provide the best care possible,” Cardoza Conner added. “And when many of us think of our Cal Poly athletic trainers, there’s always one individual that comes to mind and that has been a constant with this program. Slover, an assistant athletic trainer for 11 years, replaced Steve Yoneda as Cal Poly’s head trainer on July 1, 2002. 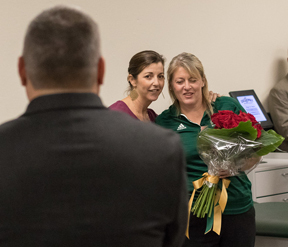 She is in her 27th year as a professional in Cal Poly’s Department of Sports Medicine. An additional $40,000 is needed in support of new equipment. All gifts are fully tax deductible through the Cal Poly Foundation. Those interested in making a gift should contact Ashley Offermann at aofferma@calpoly.edu or 805-440-9792. Story courtesy of Eric W. Burdick, Associate Media Relations Director, Cal Poly Athletics. Click here for story.